Anne grew up in Cincinnati’s Clifton neighborhood with an eye for historic architecture. From a young age she would take the bus downtown and explore the architecture of Over-the-Rhine. It's no wonder she has earned multiple degrees in historic preservation and public history and is currently a doctoral student at University of Cincinnati studying urban and public history. Although Anne lived in New York for 13 years, she proudly calls Cincinnati her home. Her project, Look Here! was inspired by three place-based exhibitions. Queer Spaces, The Museum in the Streets, and Jay Shell’s rap lyrics project had a direct impact on Anne and led her to notice Cincinnati’s lack of historic, place-based projects. While there is plenty of historic information about the city of Cincinnati, little is made easily accessible to the public and less is available for the community to discover. History is traditionally told from the educator’s point of view. The teacher tells you what is important, and often what to write down. 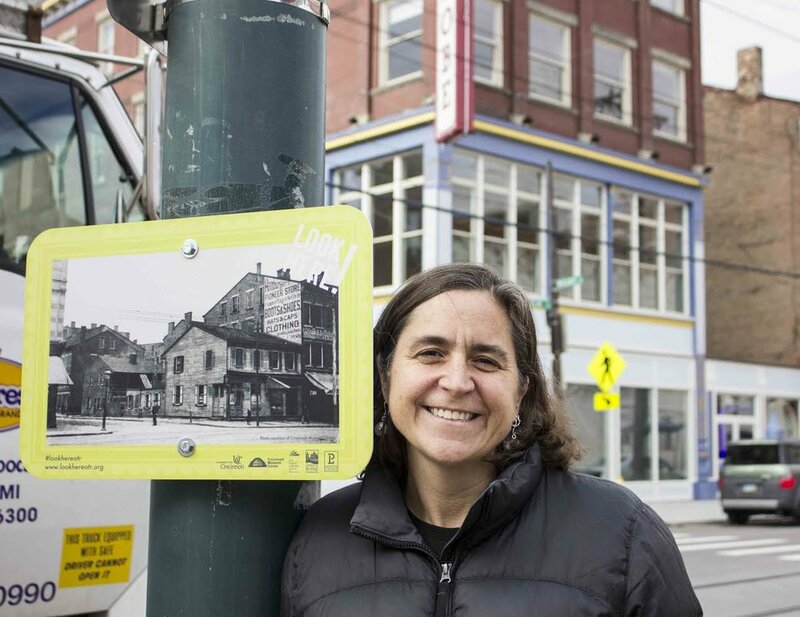 Anne is challenging that with Look Here!, an exhibition of 70 historic photographs mounted on street poles throughout Over-the-Rhine. Look Here! is photography based; unaccompanied by facts, stories or dates. One goal is for viewers to construct their own understanding of the past through exploration of the images.There is a map of the photographs around Over-the-Rhine, however, Look Here! is meant to be a serendipitous experience. The hope is for people to stumble upon the images as they are walking or be coaxed out of their comfort zone by a picture in the distance. This project had been in the works long before Anne received a People’s Liberty project grant. She had already collected over 350 photos from seven repositories which helped her hit the ground running on Launch Day. While Anne worked with her graphic designer to create an eye-catching brand, a team of volunteers set to the streets to determine which photographs would be on display. The photographs had to feature at least one feature that was currently standing and recognizable and have a compelling element such as people, cars, or store-fronts. As with any project, Anne had to overcome some setbacks. Due to Cincinnati permit laws, she was unable to use the aluminum signs she originally planned on and had to find an alternative material that was durable yet also met city requirements. Despite the unexpected hurdles, Anne met her revised goal of having all the photos hung before Thanksgiving. One thing Anne would like to change about Look Here! is the fact that there are very few photos representing modern history,1960’s and on. Despite her best efforts, she was unable to find more than a few publicly accessible photos dating after the 1950’s. People rarely think of the present as interesting, causing limited representation of the modern period. If you have interesting photos of Over-the-Rhine in recent years, Anne encourages you to donate them to public photographic repositories like Cincinnati Museum Center or the Public Library. How many Look Here! photos have you seen? Share your experience here and learn about bringing Look Here! to your neighborhood.